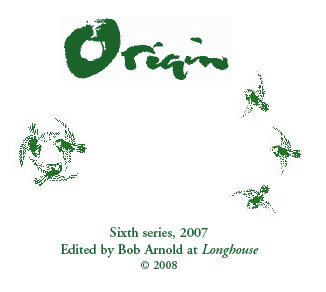 In late 2003 Cid Corman, the founder and editor of Origin magazine Series One-Five dating from the early 1950s, with a revitalized spirit gained from his recent Milwaukee and Lorine Niedecker Centenary USA visit, conceived the idea of Origin's Sixth Series to be an online and printed edition. With the typical Cid energy and expansiveness, upwards of twenty issues were planned in collaborative assistance with Chuck Sandy, a newly found friend and educator who also resided in Japan. Unfortunately, Cid only sketched out Origin issues 1-4, instead of his intended twenty issues, and this came with brief notes, recommendations and plans for the featured poets. Before Cid's hospitalization and passing in March 2004, Issue 1 was partially established with the feature poet, some solicited manuscript and art work formation, and the go ahead given by Cid to get this published. Onward! During the summer of 2006, Chuck Sandy having hoped to publish these first four issues, shipped from Japan the Origin Sixth Series notes, manuscripts and skeletal framework to Bob Arnold, Cid Corman's literary executor, here in Vermont. Now, how best to evolve this 'wunderkind' into a 2007 festive tribute by editor Bob Arnold with contributing editorial work from one of Bob's close friends John Martone. Following Cid's notes, and after working years together editing and publishing, Bob has taken this Origin conception and elaborated upon it as a working collaboration with Cid's & John's editorial spirit. No stone left unturned. We couldn't make an official Origin without Cid at the helm, but we sure could make a festival and tribute to Cid from it all. The new Origin is inclusive of old & new and as a tribute to Cid's Origin legacy. Herein will be gathered some of the feature poets as Cid had hoped, together with much new art work, photography, many new poets, translators, and essayists gathered up and representing what were known to Cid, and more importantly what should be or might have been known by Cid. Certainly work he would have welcomed, or at least been intrigued by. There are no guarantees, but regions of taking risks and making discoveries. The first three Sixth Series Origin issues had definitive plans for feature poets with contributions by other poets and artists based on Cid's notes. The featured poets for these three issues are true to Cid's intentions : Bob Arnold (Issue 1); Charlie Mehrhoff (Issue 2); and John Martone (Issue 3). The original fourth issue featured poet per Cid's notes dropped away for personal reasons ... since then, we have chosen and received with wonderful enthusiastic response the works of the new 4th issue featured poets : Dale Smith and Hoa Nguyen. There are no absolutes with morphing this Origin anthology. It's a re-creation, not a clone. Liberties and license? Of course! If staying the course with Cid's 2003 draft and notes exclusively, Origin would be static & staid. Cid, too, would no doubt have re-edited the issues, and now we are gathering this series as a vast tribute to Cid & poetry (often the same in this poet's mind and living) combining the past with the present. It's not about being a mirror image of Cid's conception. Rather, it's a reflection becomes a tribute becomes a festival. All issues are to be published online as web pages and available for download as PDF files. These issues will include unpublished essays by Cid Corman, as well as prose, poetry, translations and art work gathered by the editors. Longhouse plans to further publish a selection of the contributions from its booklet and postcard series, and these will be available in print as limited editions throughout the year - often appearing as scouts on the trail ahead. And with this - many, many thanks and kudos to the contributors who have not only submitted their own work -- and to friends with financial donations -- but to those who also suggested others that should be, might be and are now a part of Origin. The online issues will begin to appear on March 12th (Issue 1) the day of Cid's passing. To be continued each month following, with the last issue (Issue 4) appearing on Cid Corman's birthday at the end of June. Readers awake!